Of all the branches of Mathematics, Statistics has a very practical application in solving real world problems. Though I firmly believe all wisdom and knowledge come from God, the area of Statistics falls under the wisdom spectrum as it gives innate ability to understand and give answers to practical problems. I am sure when Joseph and Daniel conducted the affairs of Kings they had a sort of statistical wisdom. Take for example Abraham Wald (1902- 1950) worked on war problems during World War II. Wald invented some statistical methods that were military secrets until the war ended. He was asked a probing question as to where extra armor should be added to airplanes. Wald studied the data of the location of enemy bullet holes in planes returning from combat. He then plotted the locations on an outline of the plane. As data accumulated, most of the outline filled up. He then came back with the solution and told them to put the armor in the few spots with no bullet holes. Wald said that is where bullets hit the planes that didn't make it back. The software industry has been through high and lows up with the constant advent of new technological innovations and rapid changes in the global economic landscapes. 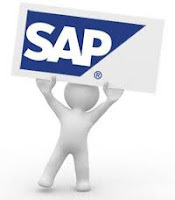 SAP is the leading enterprise application software giant started by Hasso Plattner. The rise of Enterprise application industries started in early eighty’s with organizations needing one single software program that was capable of serving the multiple needs and functions of various departments. One single enterprise-wide application software means integrating applications that fused together for the smooth exchange and extraction of information. For example when customer services sold a product and got stock updated in the inventory by the warehouse people and the same data could be pulled by the Finance department. Enterprise Application software’s were designed exactly to do the latter mentioned processes seamlessly. SAP started by break away engineer’s Plattner and group build the company on strong engineering forte to build these types of applications that served large enterprise needs. Samuel Tsang and Farhoomand have attempted to explain SAP’s platform strategy in the changing scenarios of the enterprise application software market to survive and sustain itself in the market competition. They give a brief overview of the impact of ERP (Enterprise Resource Planning) on the enterprises, the downturn in the ERP Market, and the new trends in software industry, the advent of service oriented architecture and pay as you go model of software services. The authors of the paper go to explain competitive strategies of SAP’s competitors like ORACLE, Microsoft, IBM and the new breed of companies from the east that pose as a viable threat to its market share. SAP has traditionally enjoyed the high market share. The early eighty’s and early ninety’s enterprise software’s were considered complex proprietary and hard to implement software’s. SAP with its closed source software made high margins and capitalized its position in the market. However with the rapid changing trend of the technology especially with the advent of Internet and open source models SAP soon found itself in a sticky situation. This often happens to giants who have not effectively managed their structures and aligned their strategies with changing market scenarios. SAP soon found it would have to open its proprietary software products for open development and integration, lure in small and mid-size businesses and modify its ERP applications to be web based. Bourgeois quotes “The development of organizational strategies is to guide organizational activities. They are key managerial functions and that guidance is accomplished through the effective co-alignment of organizational resources with environmental conditions” (Bourgeois, 1980, p 37). Thus strategy making lies in the skill and abilities of the managers who respond strategically in things that must be done to adjust to the environmental forces that impact their organization (Thompson, Strickland & Gamble, 2007). This involves dealing with all factors like political, economic, cultural, regulatory & governmental and technological innovations that happen from time to time. SAP’s position as a market leader was being challenged in all the above macro environmental factors with its interaction in the market place. The author will attempt to analyze from the paper SAP’s position using PEST. The political landscape in the enterprise market was changing rapidly with SAP’s key arch rival Oracle. Oracle mainly served the database market and supplied functional software’s that supported the back office operations. SAP and Oracle both dominated the enterprise application software market but in different parts of it (Farhoomand, 2006, p.11). Oracle’s hostile bid on PeopleSoft in 2003 to acquire PeopleSoft clients which was a player against SAP was turned down but in 2004 the takeover was complete at $10.3 billion which affected SAP’s market considerably. SAP to correct its position attempted to take over Retek a retail software developer for about $500 million to align its portfolio but again Oracle strategically acquired 10% of Retek and later on purchased Retek for $670 million which in turn led to the development of Oracle’s business unit called Oracle Retail Global (Farhoomand, 2006, p.12). SAP’s market share was now being affected in the enterprise application market with Oracle’s key acquisitions. Oracle’s also equipped itself in serving enterprise software’s as services for its clients, this was also a strategic attack on SAP’ high costing implementation thus economic spheres of SAP’s core business model was threatened. At the same time the economic landscape was changing rapidly with the rise of small and mid-size businesses, the largest software maker Microsoft quickly capitalized on this segment by implementing strategies and not directly engaging Oracle or SAP. Here again SAP was late in its strategy alignment of scaling down the ERP software’s to fit the business needs of small and mid-scale enterprises. In the 1990’s SAP also was caught up in failed implementation of its key products with large enterprises like Dell, Nestle and other companies who could not change or scale their business model to the requirements of SAP software’s. In the cultural sphere SAP didn’t quickly realize the power of open source and independent developers that were providing enterprise wide solutions. Businesses were piece by piece stitching their needs by buying software’s from these types of vendors. Companies were increasingly adopting strategies by buying modules from niche software makers. Farhoomand states according to a survey conducted by Harvard Business School 60% indicated their companies had adopted the approach piece-meal software’s together to serve enterprise needs (Farhoomand, 2006, p.4). This approach benefited businesses as CEO’s increasingly were demanding from their Chief Information Officer’s return on investments on the corporate IT spending. Technology factors impacted SAP heavily with the advent of the Internet. Organization’s found suddenly the need of becoming e-business ready with e-commerce and access information on the power of networked economy. SAP introduced mySAP.com a software package aimed to become a business to business portal. To catch up SAP engaged in acquisition strategies of e-procurement software companies. Another major change in the technology sphere was the rise of service-oriented architecture which was a framework of developing and integrating application through Web Services. This meant an application could be developed in .net, java or any legacy system and could be easily all integrated by Web Services. Traditionally Businesses bought technology solutions and had many systems running, the SOA model suddenly allowed talking between different systems to be easy and a matter of configuring the components. This was to greatly impact the Enterprise Application software giants as they would not only would lose a large market share but had to rethink their strategy implementations in coming up with a product that used this powerful model. 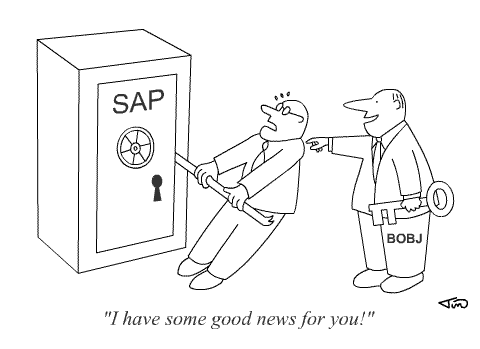 SAP’s response to this came in a product called NetWeaver which was essentially a Web Service solution which gave enterprises’ the option of connecting their legacy databases and systems. SAP’s main strategy involved in expanding and covering functionally related markets. SAP’s strategy involved in branching out to related areas like customer relationship management (CRM), product lifecycle management (PLM), supply chain management (SCM) (Farhoomand, 2006, p.9). The focus now changed from not just aiming at the large enterprises but small and mid-size business ($600 million or less). This fast growing segment meant coming up with these functional products and cutting down development time by acquisition of companies that already had a decent product that served these functional needs supporting examples would be SAP acquiring Light hammer Software Development Corp. in mid 2005 and TopTier Software a Silicon Valley startup in 2001. To serve the customer’s in the mid-market segment SAP scaled down its ERP products and came up with mySAP All in-One and SAP Business One. Also introduced was the pay-as-you-go model which combined elements of hosted and on-demand services. SAP’s major strategy change came with the appointment of Shai Agassi as the chief of corporate product development who came on board with the acquisition of TopTier Software. The strategy was to open up SAP the proprietary software so individual developers could write and make extensions to it. SAP’s introduction was with a new flagship product called NetWeaver as mentioned earlier in the paper it was a platform that allowed applications to be developed and accessed as Web Services running on different systems. NetWeaver was given away free to solidify and expand the use of the software with third party developers. The strategy was successful by 2003 as it brought customer support and strengthened its core for its full fledged launch in 2007. The introduction of NetWeaver was a very important one strategically both platform wise and in the economic sense of SAP’s survival in the marketplace as it helped configuring itself not to just depend upon its core engineering strength but successfully attract tens of thousands from the developer community supporting its model. To make this more successful SAP hired George Paoline who helped Sun Microsystems market Java to come on board and he soon was successful in forming a network on 132,000 individual developers as part of SAP’s online network (Farhoomand, 2006, p.11). SAP was also influential in hiring away 200 top managers from competitors like Oracle, BEA Systems, and Siebel to join their company (Farhoomand, 2006, p.11). SAP thus successfully integrated its core engineering strength by the introduction of NetWeaver and connecting individual developers from the external environment to develop extensions and tying in legacy software’s that existed within businesses. Businesses actively supported this open model as it brought their own IT spending down. The introduction of NetWeaver as a platform was important strategy as it was crucial for SAP to enter and penetrate the new small and medium scale enterprise customers as it was the biggest growing segment. During the economic downturn with dotcom’s crashing, SAP was able to leverage its strength of being an established software vendor which was reliable and customers turned to it for their needs. This gave also SAP sufficient time to catch up with the Internet Boom and bringing out key products like mySAP.com and building and scaling of enterprise portals that were web based to serve enterprise needs. Porter in his famous paper quoted “Competitive strategy is about being different. It means deliberately choosing a different set of activities to deliver a unique mix of value” (Porter, 1996, p.64). SAP has attempted to create this unique mix of value by the introduction of these products. The Enterprise marketplace continues to be an interesting and a fierce battle arena as small players are challenging the might of the established giants. The feature rich application with simplicity at its core which increases organizational effectiveness and overall efficiency at the lowest cost will win and the organization that aligns its strategy to bring that into the market will be the final winner. Borgeouis, A.M., III. (1980). Strategy and environment: A conceptual integration. Academy of Management Review, 2(1), 25-39. Thompson, A. Strickland, A., & Gamble, J. (2007). Crafting and executing strategy: The quest for competitive advantage (15th ed.). New York: McGraw-Hill. Porter, Michael E (1996). What is Strategy? Harvard Business Review, 74, 6, 61-78. I recently was made aware that immediacy of objects, values and street innovation extend the product ideas that will be instrumental in making them universal. The lessons to be learnt are how do you design a product or a system that can be extended or be universally accepted. The proposed idea is to watch for ideas that come from the streets, reverse engineering, social re-engineering and innovative social uses of products or ideas. For example to expand on this a cell phone owner in Uganda becomes an instant ATM. Strange Isn't it? People in Uganda use cell phones to transfer money and exchange minutes for cash. How does it work you may ask? So if you live in Kampala and have a cell phone and you want to send money to your parents in a small village a few hundred miles away you would buy a pre-paid phone card with minutes on it and transfer it to a person in the village where your parents live who has a cell phone. So from Kampala you would call this person and give him the card number transferring the minutes on your card. The cell phone operator on the other end who receives your call charges a 2-10% commission, collects the minutes and dispenses the remaining cash to the caller's parents. Street innovation and extension of a innovation or idea gives insights how the Ugandans use an everyday object like the cellphone in the absence of a sophisticated banking system. I like the concept of connecting insights to values and coming up with the right idea to produce a solution. BRILLIANT! Fit Analysis- Is it Business ‘Fit’ or Technical ‘Fit’? Enterprise Architects/IT Teams along with their business counterparts struggle with the idea of how to effectively engage the senior leadership regarding an application system that clearly does not fall in architectural/technology standard or simply the business standard. 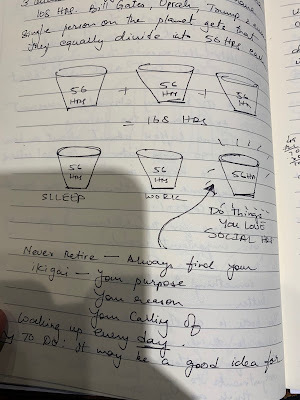 Recently talking to senior leader in our company his suggestion was – IT seems to have too much time on its hands to do a “What If” analysis. The comment didn’t catch me by surprise as the individual has hard time understanding not just technical but the business side of things too. A simple technique called FIT analysis can help in preparing a presentation for the senior leadership. The objectives mainly revolve around convincing the management about validating the IT road map for an application, make a strategic decision for better IT alignment and better maintenance of your application portfolios. Quadrant A: High Business Fit but Low Technical Fit. Projects or applications that fall into high business fit and low technical fit Quadrant A have a strong case from the business front but weak support or problerms in implementing on the technical front a good example here is at work we have a mission critical membership application piece written seven years ago, time to update it has long gone past but the lethargy of the management to change it or put substantial effort to revamp it lacks. On the other hand the code base is hard to maintain, is older technology and don’t meet upgrading or current IT standards. Sometimes an application or project may have a high business fit because the application owner or the project initiator has power of say or decision making but in reality the application may have a low business fit with other corporate strategies or a low technology fit that hinders standards alignment. 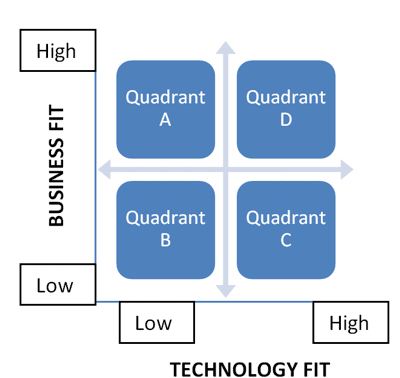 Quadrant B: Low Business Fit and Low Technical Fit. Sometimes applications and projects fall into a category where it is a low business fit and a low technical fit. At work we have an application that does not have a monetary value or even a perceived benefit value, yet time and resources are spend sometimes behind these small applications. Support of replacing such systems in an organization is strong but again it hinges on who the application or program owner is. Traditionally the application remains without any measurement of the perceived benefit. Quadrant C: Low Business Fit and High Technical Fit. Applications and projects that fall into this quadrant do not have a strong business support but have a strong IT support because of its meeting the IT alignment standards. When this happens it becomes imperative for IT to do more detailed "what if" analysis of how it affects the business ROI and find substantial reasons as to how it plays into the strategic positioning of the benefits matrix in the organization. The important thing here for enterprise architects is also to show how other functional requirements can be added or scaled to make it more relevant or congruent with being business fit. Quadrant D: High Business Fit and High Technical Fit. Applications and projects that are mapped into this quadrant typically have strong support from both the business and technology. This quadrant is the most comfortable quadrant for the EA. The EA does not have to worry convincing the stakeholders for undertaking such projects as most of the times they are mission critical. This tool is most effective when this exercise is carried out in partnership with stakeholders or application owners most of the time senior leadership. The management is asked to plot or give their take on Business Fit and Technical Fit and rationale or reports they want to generate. The IT architect takes this rationale and along with the CIO story boards the technical side and comes up with a model of how optimally can this application move towards being business fit and technical fit keeping IT alignment in mind. The plotted data will give how close the points fall to Quadrant D and then decisions are to be made are we going to go for it or not. Or go for it keeping strategic advantage in mind. I have long maintained the view that cost accounting is art and science. You can master the mechanics and science for a given industry or domain but the art is a debatable matter. Part of every cost accounting is the function of budgeting and it usually falls under two spectrum one is accounting for every cost possible and fix the costs and spend strictly around the allocated costs, but in real world we know this is sometimes not accurately possible so we operate within margins, this is my favorite method, the other is what is practiced in the industry most of the times that is to take estimated costs of the items and take an educated guess about things that you cannot account for or allocate x amount of resources add all of it and spend what you can afford as operations pan out. The first approach when integrating technology as a strategic component becomes inflexible because in three or five year cycles corresponding maintenance and service cycles do not match with your cost accounting schedules. Also new initiatives and new projects cannot be thought of to react to market conditions. The companies that enforce the first method strictly are like elephants strapped under the weight of inflexibility and unable to innovate because of the fiscal straps from the CFO and the CFO wonders why IT solutions are not up to date. The other spectrum is where top dog has the final say what can be spend and what cannot be spend which also can stall innovation or it’s a hit and miss game. So Is there a middle approach that can marry cost accounting effectively with IT integration, alignment and new project initiatives. The idea is to avoid shooting from the hip or avoid extreme control. My proposition is to develop the business analysis function in such detailed way that an organization can have a matrix system of decision making where all the details and outputs of a business analysis research plan can be plugged in and decision for “yay” or “nay”. The CFO and the CIO are strategic members of this team along with the business analysts where infrastructure, cause/cost for project, market needs, market analysis, expected outcomes, expected returns and requirements strength are all producing outputs that determine significance for the pre-determined ratio of acceptability. This ratio of acceptability is something the senior management decides in terms of overall profitability and direction they want the organization to move towards. I personally think this can be game changer but the catch is development of such an business analysis matrix that aligns with cost accounting takes time to develop along with the thorough process of a fine tuned business analysis machinery where we have expert BA’s collecting the requirements keeping the cost matrix system in mind. I would even go to the extreme of having a team of analysts that work on every strategic plan or project initiative the organization wants to embark upon.